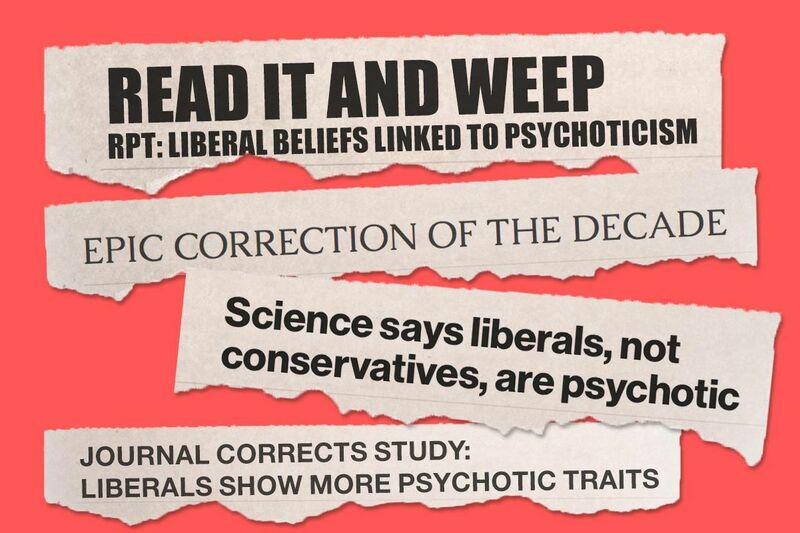 Liberals are not as psychotic and authoritarian as conservative fake news sites would have you believe. I was reading Gabriel’s blog, which had this story on how “Study from 2012 now corrected to show liberals, not conservatives, more authoritarian”. With the current furore over fake news – and with the story itself looking somewhat dubious – I thought I’d dig a bit deeper. First, I found the actual paper in question. I also found the erratum that had been published. Then, I found this page which had a link to “Why It Took Social Science Years to Correct a Simple Error About ‘Psychoticism'”. The story provides both background and backstory to how the error was made and how the correction came about. I was still curious about the authoritarian bit, though, as the story made no mention of the term. Blind obedience to higher authority combined with a vindictive attitude toward weaker individuals. In other words, authoritarianism in this context doesn’t have the same connotation as the authoritarianism ascribed to dictators and despots. It has more to do with a rigidity of world-view, and this authoritarianism is expressed in different ways as compared to conservatives. That is, while conservatives will agitate against abortion, art they deem shocking, non-heterosexual sexuality, etc., liberals also do so in similar ways: safe spaces, gender pronouns, microaggressions, etc.